Water of zam zam has special characteristics. Its usage has many health benefits. It can be used to take bath with it. It can be used to wash hands, wash eyes and ears. It can be used for perform wudoo. The Prophet Muhammad (SAW) said the best water on the surface of earth is that of Zamzam. In it there is a food for the hungry and a cure for the ill. 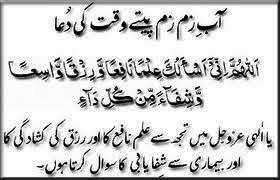 Suggested dua while drinking Ab Zam Zam is below. If Zamzam water is mixed with ordinary water, does it still comes under the rulings on Zamzam water? It is better to drink Zamzam water on its own; if it is mixed with other water, the rulings on its virtues still apply and it is permissible to treat sickness with it, even though that detracts from how it would be if it was purely Zamzam water. If Zamzam water is mixed with other water, the mixture will have the barakah of Zamzam as much as the ratio of Zamzam in the water. Zameen par sab se behtreen panni Abe Zam Zam hai, yeh kaane waale ke liye khaana aur bemaar ke liye shifa hai. Zamzam ka chashma jari howe taqreeban 40000 saal guzar chuke hain. Ab-e-zam zam mubarik aur sharafat wala pani hai. Aab-e-zam zam ke bare main aik hadees hai ke “Zameen ke upar sub se behtareen pani Abe zamzam hai.” Rasool (SAW) ne is se wazu karne ko sunnat qarar diya, zayada peene aur serab ho jane ko imaan ki ilamat banaya. Aab e zam zam ka pani peene ka tarika ye hai ke is water ko kharay ho kar piya jaye. Ab-e-zam zam main bohat sari barkatain aur beshumar bemariooon ka ilaj mojood hai. Is mein har bimari ke mareezon ke liye shifa hai. Zamzam ka pani na sirf pyas bhujata hai balkeh is mein ghazait bhi payi jati hai. Ab-e-zam zam na sirf Muslims balkeh puri dunya ke insanon ke liye aik azeem qudarti tohfa hai aur is ki barkatain bhi bohat hain. Is babarkat pani ke peene ke adab darj zail hain. Abe Zamzam khare ho kar peena chahiye. Abe Zamzam petay waqt qibla ki taraf munh kar ke piyain. Abe Zamzam 3 saanson mein peena chahiye. 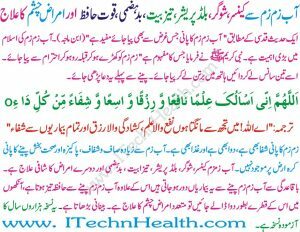 Abe Zamzam Seedhay hath se isay piya jaye.